What could be more “in” than throwing “Simple Stunning Parties At Home”? I spent the holidays in NYC this year (you can read my reviews here)returning mid-January to mounds of mail which I only recently finished opening. I know, it’s a feeb excuse for not telling you about this fantastic, party-throwing guide, Simple Stunning Parties At Home, in time for your Christmas/New Year’s get-togethers. But it will still provide indispensable help for upcoming gatherings such as Valentine’s Day, Mother/Father’s Day, a birthday, poker night, a hen-do, etc. Heck, you can even get a head start on planning your 2011 New Year’s gala. 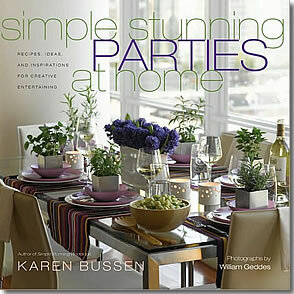 New York- based event planner, Karen Bussen has written five books in the “Simple Stunning” series so she really knows her party ABC’s. The best part is that she can show you how to throw an A-list party on a B-list budget! Karen’s “less waste/more taste” strategy can help you plan an elegant (yet surprisingly easy and affordable) party in the comfort of your own home. -Dining alfresco almost guarantees that your guests will have fun. For decorations, trim the table umbrella with icicle lights or plant some tiki torches in the lawn. Since booze can really break the budget, Karen suggests filling old wine bottles with pre-mixed Sangria, Margaritas or lemonade, slapping on fun labels and storing in ice buckets. PS. Her easy recipe for Manchego Jalapeno Cornbread alone is well worth the price of the book! Check out Karen’s website for more tips.